The Gaiety Theatre was originally established in 1864 as the Strand Musick Hall. The first building was demolished in 1903 to make way for the Edwardian re-development of Aldwych-Kingsway and to accommodate the widening of the Strand. The New Gaiety Theatre opened the same year. The theatre closed in 1939 and never reopened. It was demolished in 1956, due to structural damage received from the war, attempts at refurbishment were abandoned. A new luxury hotel is currently being constructed on the plot, The Silken hotel. 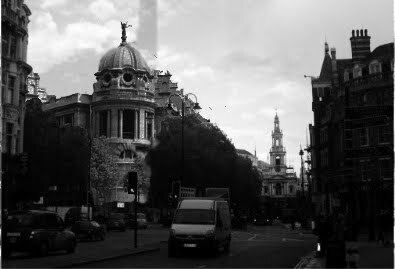 As with most of the earliest buildings of Aldwych-Kingsway, the theatre was built in a rather fanciful interpretation of the French Beaux-Arts style.